Understanding the life cycle of an image has become a critical element of planning your digital imaging workflow. Part of this understanding includes understanding the relationship between each decision in the workflow process. If we do not make informed decisions early on, this may result in an enormous amount of time spent “cleaning-up.” This can compromise the quality and vision of the work or require a redo, often at our own expense. With the proper amount of planning and decision-making, many “could be issues” become non-issues. The goal of planning is to determine what questions to ask and how to proceed with the decision-making. Digital has often been referred to as instant gratification – immediate results without a lot of effort. At first glance, this may seem to be the case because images are immediately visible or available. But, to the uninitiated, these claims do not take into account the value of a consistent and high quality end result. Collect all the pertinent information necessary to make smart and appropriate decisions in relation to a specific job or project. Knowing as much as possible before starting a job or project is critical. Know all the deliverables. Ask questions. Where and how will the work be printed? If printed, will it be done on a traditional press or digital press? Paper stock, weight, coating, and color, is it certified paper (been tested on the particular device)? If the work will be going to alternative substrates, what kind of testing is required upfront? To web – what will the other elements on the page be? And of course a critical component of planning is budget. This tends to dictate everything. Establish a hierarchy for storing the work in progress (back-up for captures, files, catalogs, PIE work, etc) as well as for completion. Information related to folder hierarchies is in the Archive section. Take lots of time with this section: develop a plan to make a workable structure for yourself. And it should be as bullet-proof as possible! There are many ways to approach this and it requires that you create a system that will fit your individual needs along with providing scalability for the future. Directly related/connected is Naming Conventions, which is discussed in the Ingestion section. And general working conventions are discussed throughout dpBestlfow.com. These steps should be thought out and tested carefully, ensuring that they will work for you and have longevity (protect your investment). This does take time and effort but is well worth the investment. Having clarity with these issues and establishing a fundamental structure with conventions helps you maintain an efficient workflow, saves you time, and avoids frustration. Organization and proper set-up of your equipment can also fall into this category. Have you taken the time to test each of the elements and devices that you will need in the imaging loop? Keep records of what you test and the results so you can use them again. We will keep stressing this point: don’t constantly keep reinventing the wheel! While working, best practices need to be implemented with consistency. This, along with a pragmatic adherence to a workflow, will make your imaging life easier, more efficient, and allow for more conceptual and creative time. Discipline and consistency are key. It is critical to stop occasionally, review the process and how you are doing it, and determine if you can adjust for more efficiency and better results. Again, consistent, pragmatic critical thinking is required. Finding the ideal scenario requires keeping a record of what you do. There are many ways to do this while working – you can keep an analog notebook marked by date and project or keep everything in a digital form and then assemble into a document for later use. We will go over the numerous ways to record your processes and experiments (build once and use many times) quickly so you can free your mind to focus on your work. Of equal importance to record keeping is properly communicating that information to the appropriate people during the workflow. There are many levels of knowledge and comfort in the industry. A best practice is always to document and communicate the necessary information during hand-offs. Don’t make assumptions! Skill levels and understanding of all the variables will vary significantly with each reader. Each person may not feel competent in every area, nor have a need to be proficient in all. Depending on your entry point to digital photography, you may be selective about the areas you choose in which to become highly skilled. Regardless, it is important to have a clear understanding of how each of these knowledge bases interacts and becomes dependent on every other. This understanding will help to minimize the struggle and frustration of pushing and pulling images through an unknown process. Once black holes and nebulous areas are identified, resources can be found to resolve the issues at hand. 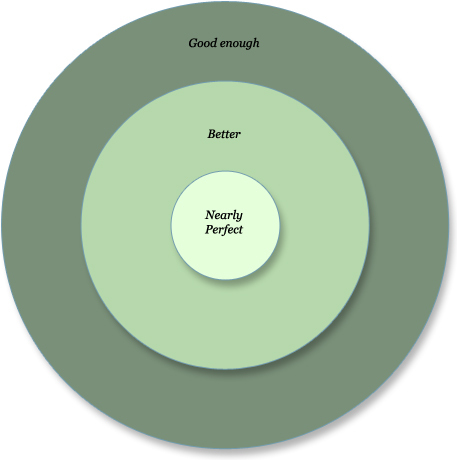 When printed out on a consumer-grade inkjet printer directly from a memory card or displayed on an uncalibrated consumer-grade monitor, images from consumer-grade point-and-shoot camera would most likely give a result somewhere within the large green circle. No deep knowledge of color management, file types, or sharpening is required to hit somewhere within this large target. If you use computers with calibrated and profiled monitors with advanced software for color correction and image manipulation and use high-quality digital printers, you will move into the smaller light green circle. If you use high-quality printers with custom profiles, you will move closer to the center. At this optimum level, a reasonably complete understanding of color management, file types, sharpening, and post-production techniques is required. The use of high-end monitors, custom profiles for printers, along with expert knowledge of color management, file types, sharpening, and post-production techniques will put you reliably into the center circle. Museum photographers won’t be satisfied until they occupy the space between the words Nearly and Perfect. Camera choice figures into the quality equation, but not in a simple or linear way. A digital scan back may take the highest-resolution pictures, but a point-and-shoot image from the frontlines of Iraq, or even a camera phone image, may rise to the level of nearly perfect, if content, timing, and artistic intent are considered. It is important to consider that quality has more to do with preserving the artistic intent than with any threshold megapixel number. Certain job types based more on technical ability to accurately document a scene or object, as needed for most architectural photography, most museum photography, and most catalog or studio photography, benefit from high-resolution capture—although the differences at the high end are increasingly subtle. Your decisions and perception of quality will change and evolve as comfort level and type of work pursued expand. We all want to achieve the highest quality results. Knowing your options and making educated decisions can help you stay on budget and timeline and achieve the results you want. Despite all the possible permutations, the underlying principle is whether the final result of the workflow will be a batch-processed digital image file, or an optimized digital image file. By batch processed, we mean image files that have been collected and processed all at the same time. May be camera JPEGs that have had metadata added and possibly been batch renamed and then processed through Photoshop with an action or set of actions that applies the same tone or color enhancement to all the image files. An optimized workflow takes digital capture beyond the batch processed file. In the optimized workflow, the photographer continues to exercise creative control after the shoot (also referred to as “post production”), which may involve image compositing, retouching, stitching, high dynamic range tone mapping and other techniques, to produce a finished piece. An optimized workflow involves more work and has more steps, sometimes many more steps than a batch workflow. Although turn-around times can be quick when deadlines make that necessary, there is usually more time built into an optimized workflow. In an optimized workflow, the photographer will tend to gather more information about the final uses. This often extends to researching the type of press and paper that will be used for printed output. Photographers that operate at the highest level in the industry practice an optimized workflow. They are usually known for their post-production skills and style, which they use to complement their pre-production conceptualization and capture techniques. 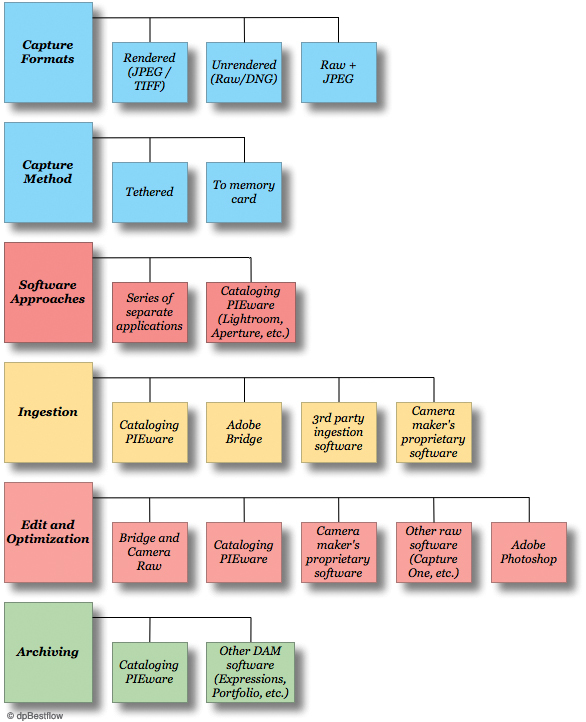 dpBestflow® recommends that the optimized workflow should always start with raw capture. If the final desired result is a stitched or High Dynamic Range (HDR) image, the captured images need to reflect the panoramic sweep or the exposure range optimally. The optimized image files will usually be a small portion of the shoot's post production. Optimized files will often be selected for optimization from a batch process of the edited and proofed shoot. Optimized files will go through a series of steps involving optimization in PIEware and may involve additional optimization in a pixel editing application, usually Photoshop. Optimized files are ideally saved as masterfiles, which are usually high-bit TIFF or PSD files normally saved in Adobe RGB (1998) or ProPhoto color space. However, they may also be raw files that have been optimized in PIEware. Master files may have capture sharpening applied, but should never have output sharpening applied.